Every reserve in the UC Natural Reserve System comes with its own small universe of biological information. When scientists and other visitors collect reserve plants and animals to study, they also record the date, the exact location where it was found, and more information. 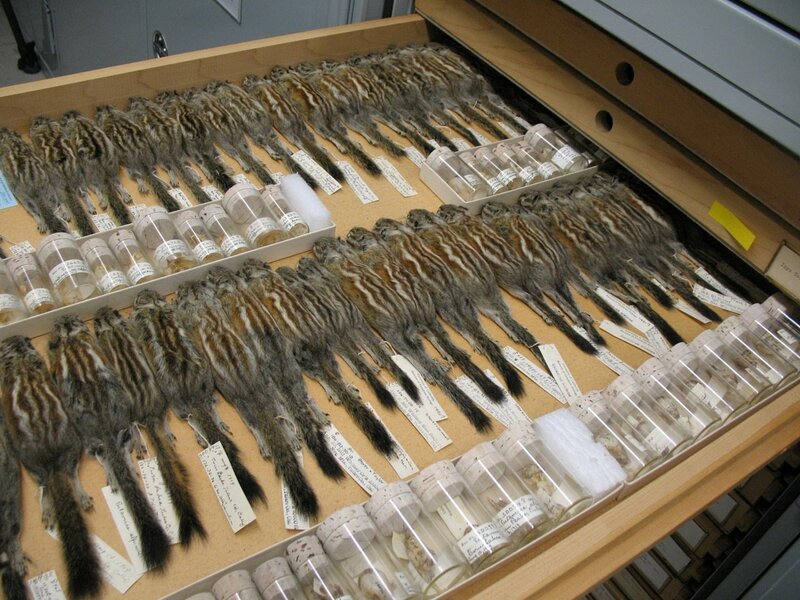 The specimen may then get deposited in a museum, while its associated information gets stored in one or more databases. But figuring out what specimens came from which reserves—knowledge useful to guide research—has long been a pain in the proverbial tail. Getting the information required checking multiple databases and coping with data delivered in a variety of formats. A ReserveMapper search for valley oaks (Quercus lobata) at Sedgwick Reserve shows at a glance where on the reserve the record. Clicking on each hit reveals information such as the type of occurrence (live specimen, preserved specimen, photo, etc. ), the record date, and a link to the source database. Developers at the Berkeley Natural History Museums have now dramatically simplified reserve record searches. "We wanted to make an easy way for users to quickly access all the Berkeley Natural History Museum records for any of the UC reserves," says Koo, a museum curator and bioinformatics expert. The result of those efforts is ReserveMapper, an online tool that offers an easy way to find database records connected with a particular NRS reserve. All users have to do is select the name of a reserve, and the tool will display a topographic map showing the reserve's boundaries. The map will feature dots where specimens or photos were collected. To narrow the query further, users can enter additional search terms such as species name or year collected. Clicking a dot reveals more detailed information contained in the record. Reserve Mapper searches records from the Global Biodiversity Information Facility (GBIF) a repository for data from the UC Natural Reserve System, the Berkeley Natural History Museums, and more than 1000 other collections worldwide. GBIF also includes references for iNaturalist, a citizen science portal which holds much of the data generated from NRS reserve bioblitzes and workshops. ReserveMapper is made possible by Holos, a project originally funded by a grant from the Keck Foundation. Holos makes UC Berkeley's biodiversity resources more accessible via tools such as the internet. 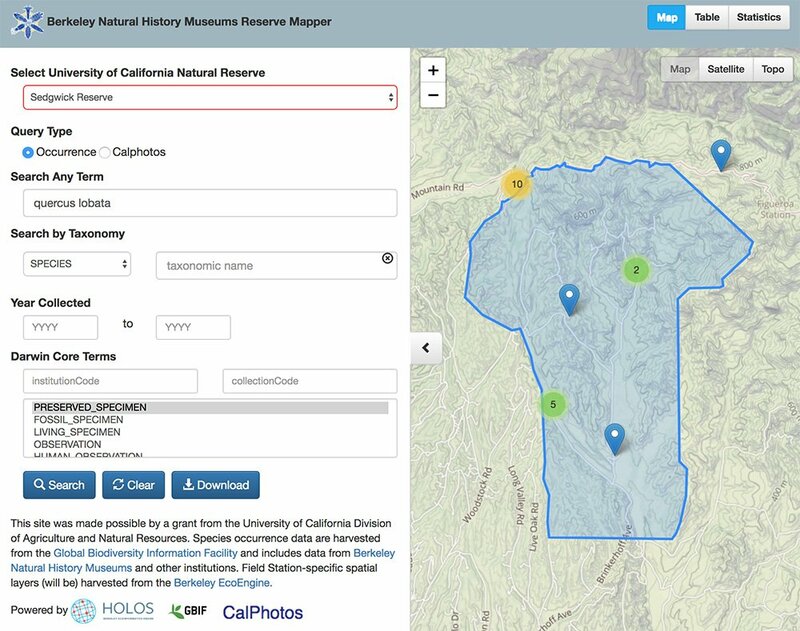 "We have since expanded to other protected area searches and now have ReserveMapper versions for California State Parks, national parks and national forests in California, and other agencies, which was fun to do!" Koo says. Those editions are accessible via the Reserve Mapper page of the Holos website. Koo and her fellow developers John Deck and Joyce Gross are now seeking suggestions on ways to improve ReserveMapper; send any feedback to mkoo@berkeley.edu.